If you recall a previous blog which linked to a crash course in global economics, you would remember a part about hedonic price adjustments when measuring the Consumer Price Index (CPI). Unfortunately, these methods are being adopted in Australia. 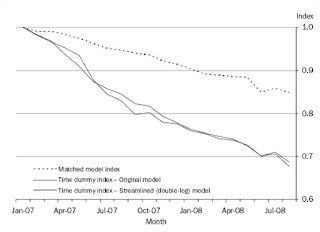 For personal computers a hedonic price index was introduced into the Producer Price Indexes in 2003 and into the Consumer Price Index and the National Accounts in 2005. That means that although prices for computer may be steady, they are falling in ‘real terms’ according to the ABS, thus we are all experiencing cheaper computing. The following graph shows that computers declined in price by 30% from July 2007-08. The same models only dropped in price 15%. So the question is: do we include the extra 15% decline in our price index? I would suggest that the methods used by the ABS misinterpret the term hedonic. Hedonic psychology is concerned with the attributes of good or service from which we derive pleasure. By breaking down a single product into hedonic attributes we can determine the willingness to pay for component parts. Hedonic analysis has been happening in property valuation since it first began. To compare heterogeneous goods we break them down into characteristics such as location, views, noise, number of bedrooms, and so on. We can then estimate how much a person may be willing to pay for an identical apartment in a different area, or with different views. In terms of the computer price index, they have taken factors such as CPU speed, RAM, memory, as the characteristics from which we derive value. But clearly this is not the case. Many people have no idea of these specifics. They just care what it can do – save music, photos, word processing, internet etc. If I write this blog on an old computer, and I getting less satisfaction than writing it on a new computer? Unlikely. A good that seems to me to be more suitable for hedonic pricing is housing. While house prices have dramatically increased, so have their quality. The renovation boom of the past decade has turned many suburbs into backyardless air-conditioned wonderlands. We can use hedonic methods to easily determine the potential price or rent of a house of apartment based on its features (this is how real estate agents do it in their heads). Now unlike computers, these features closely relate to the benefits we actually derive from the home. An extra bedroom of a given size has a number of possible uses from which we derive benefits. Adjusting for an extra room is prefereable, adjusting for the type of materials on the wall is probably not as good. Just because a more modern material is used (read faster processor, or bigger hardrive) doesn’t mean I can actually use the room (computer) for more purposes than I previously could. Since housing is a large part of household expenditure (20%+) this type of adjustment might provide interesting results. Anyway, it’s a slippery slope of political misdirection from here with hedonics. Let’s hope that PCs are just a pet project for now (they are not - one of the desired outcomes of the review of the desktop computer price index is the development of techniques to be applied to hedonic price indexes for other consumer durables), until their methods align a little better with the theory. This may involved surveys of consumers see which attributes provide them with benefits. Unfortunately it's probably not something that can be debated in the 'courier mail' or general public very easily. How do you discourage Government economic smoke and mirrors? What does it mean to 'save a life'?